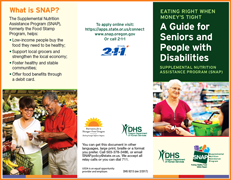 Partners for a Hunger-Free Oregon (PHFO) produces original materials for SNAP Outreach. They are available to print and download below. Outreach brochures are available free of charge through Oregon Department of Human Services (DHS). DHS brochures have been developed through a collaboration with Partners for a Hunger-Free Oregon for your use. To order free, current materials complete the Brochure Order Form below. Learn about our work to organize and advocate for food justice.